When it comes to mention the most popular places of interest in Finland, the first destination that comes to mind is Helsinki. The Senate Square is considered the historic centre of the city. The square was built in the 19th century and was designed by German architect Carl Ludwig Engel who was also involved in development of whole Helsinki. The square is internationally recognized as one of the most beautiful squares in the world. The monument of Alexander II is considered the heart and main decoration of the square. Market Square is the noisiest and liveliest place in the city. Sometimes this place is also called Strawberry Square. If you visit this place in June, you will see an amazing view – all stalls are simply covered with fragrant ripe strawberry. Other important architecture landmarks include Finland Palace, the House of Opera, the Olympic Stadium and Uspenski Cathedral. Fans of excursions will find it interesting to visit numerous historic and art museums of the city. Finland cultural sights. What to see? Some interesting sights can be found in Tampere. The city is mostly known for its magnificent sanctuaries. 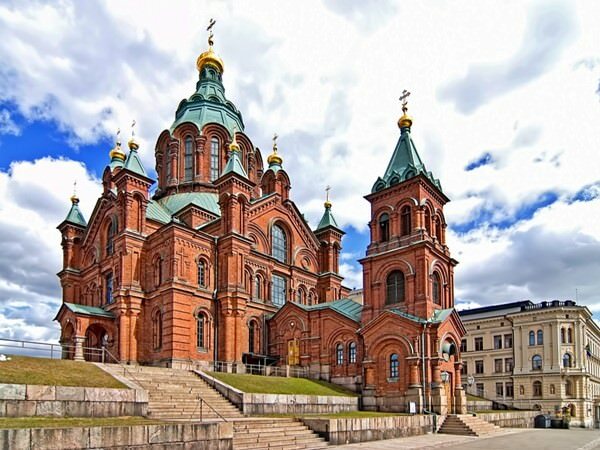 Travellers are recommended to visit Tampere Cathedral, Alexander Nevsky Church and the Church of Saint Nicolas. The city is also home to the oldest concert hall in Scandinavia – Tampere Palace. Tourists with children will enjoy many memorable moments in Sarkanniemi Adventure Park that features many park zones including a dolphin park, a zoo, planetarium and an aquarium. There are more than 20 museums in the town, the most popular of which are the Museum of Box, Drugstore Museum, Amuri Museum of Workers’ Housing, Teisko Museum, and Vapriikki Museum Centre. The best way to continue your excursion program is to visit the city of Turku, which is also known as the oldest city in the country. There are several historic buildings there, such as Turku Castle and Turku Cathedral. The castle was built in the 13th century. Nowadays, the castle holds the exhibition of the Museum of History and is often used as the venue for various music concerts, special concerts for kids and other interesting performances. The beautiful northern country has a lot of interesting symbols. One of the main symbols of Finland is deer. You can admire them during a stroll along picturesque forests. In some small towns, you can meet these animals leaving the forest directly in the streets. You also can see pictures of deer on many popular souvenirs. Lovely sweaters, socks and other knitwear of the local production are especially popular with tourists. Local residents are famous for their passionate attitude to saunas and sweat baths. 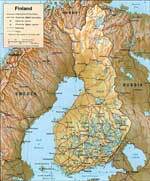 Approximately, one sauna corresponds to three persons and Finland is a confident world leader in this rate. Your visit of the Finnish sauna can become one of the main activities during your vacation. Some saunas are true local attractions. Baths and saunas equipped on the lake shores or on the territory of beautiful forests are especially popular. Finns are considered as quite conservative and unsociable people but not all of us know about their gambling nature and thirst for different competitions. During the year, a lot of interesting holidays are celebrated in Finland. The important component of them is different tournaments. Some of them may seem quite unusual to foreign guests, for instance, the competition in mobile phone throwing range. Finland is one of the most popular places for winter vacation in the world. There are perfect conditions for any winter entertainments. Skiing along forests, deer teams, fascinating skating rinks in the open air and extraordinary ice hotels, which opening thousands of tourists are annually waiting for, – these are just a small part of popular winter entertainments. This is very exciting to visit Finland on Christmas Eve when festive fairs and interesting events are held in all cities. In winter, many people visit Finland for the sole purpose to admire the Northern Lights. This amazing natural phenomenon attracts travelers from all parts of the world. In this connection, a lot of unique hotels have been recently opened. They are located in the most beautiful natural areas of the country and offer its guests to accommodate in individual small icehouses. Such house has a transparent roof, which lets admire the Northern Lights in all its glory. This article about iconic landmarks and sights of Finland is protected by the copyright law. You can re-use the content, but only under the condition of placement of an active link to www.orangesmile.com. Uspenskin Cathedral has placed in Helsinki. It was built in 1868 and is still a tremendous monument made in Neo-Byzantine style. 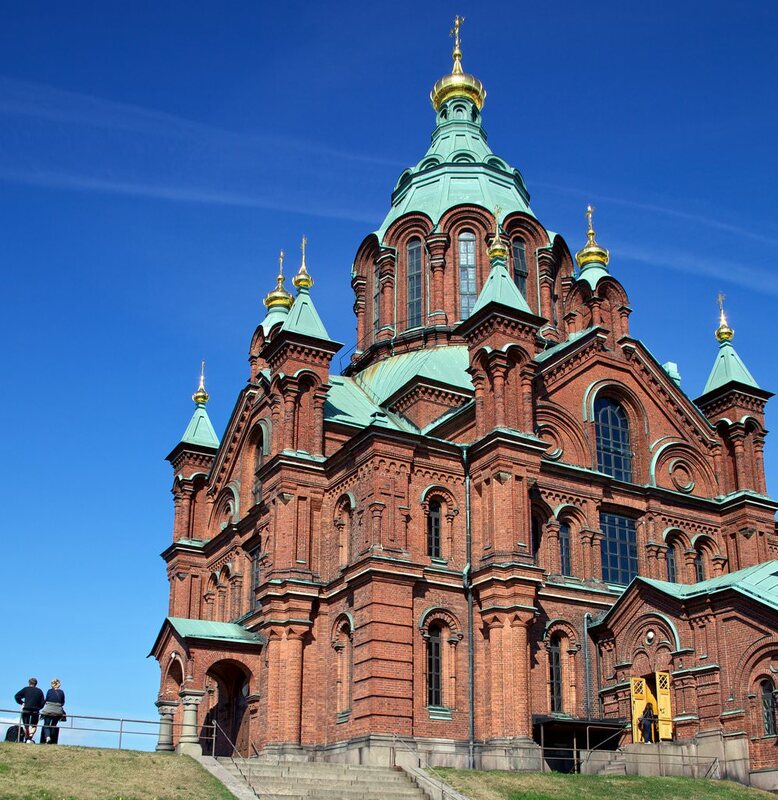 This wonderful Orthodox Church is set upon a hillside on the Katajanokka Peninsula overlooking the city. A great number of legends are connected with it. According to unofficial figures, the prototype to Uspenskin Cathedral was a nice church in Kolomenskoye. The main building material was a red brick that was taken from the destroyed Bomarsund fortress. The central railway station of Helsinki is the man landmark of the city. It was built in 1914 in the marvelous modern style. 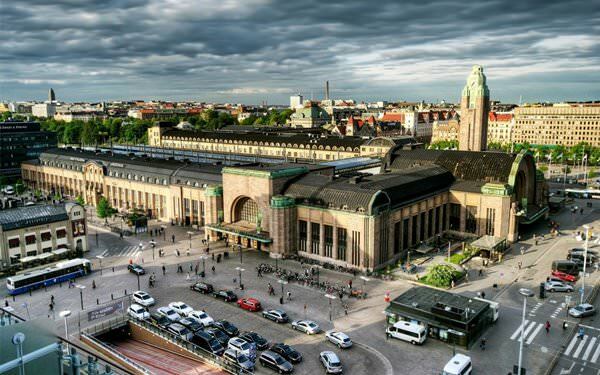 Gottlieb Eliel Saarinen – a famous architect – has projected this station. The process of the building lasted about 10 years. The station appeals both with its attractive exterior and wonderful interior decoration. 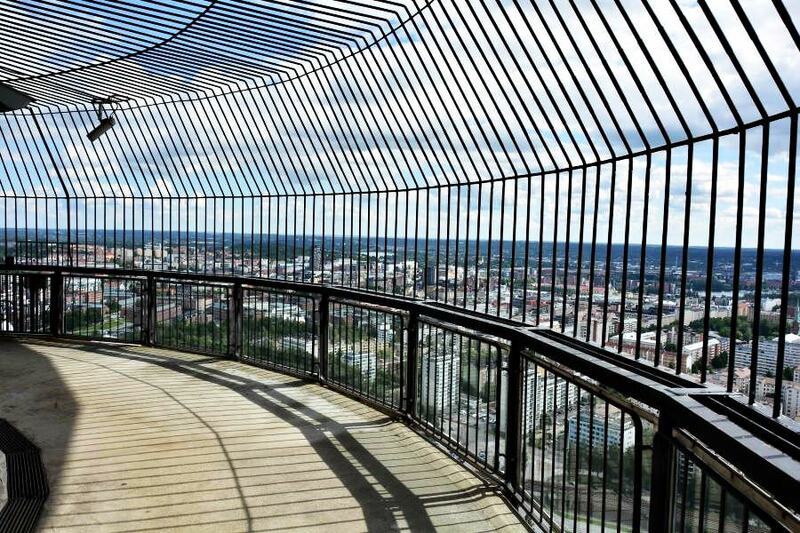 The highest observation tower in Scandinavian countries is situated in Finland. Nasinneula tower is a true historical landmark. It was built in 1971. 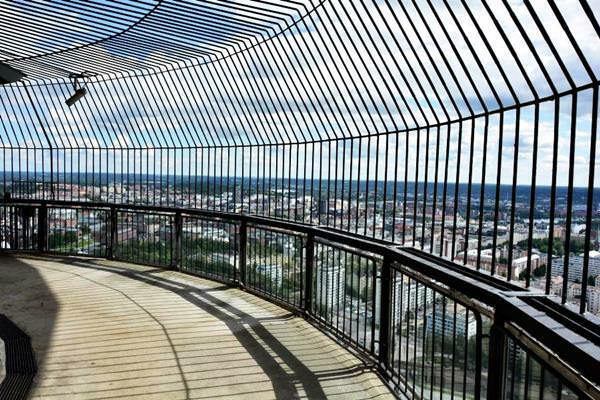 Now it is the highest observation tower, not only in Finland, but also in Scandinavia. The tower height is 168 meters, that makes it the tallest free-standing building in the country.